Four Houston area school superintendents, including HISD’s Richard Carranza, will be part of NAACP Houston Branch’s quarterly conversation on Dec. 7 from 6:30 to 8 p.m. at the Carl Walker Jr. Multipurpose Center (4300 Noble St., 77020). Attendees should RSVP by Dec. 6 here. Admission is $25 for general seating, $35 for reserved seats (available through Dec. 1), and $35 at the door. The other superintendents attending are H.D. Chambers, Alief ISD; Charles Dupre, Fort Bend ISD; and Angi Williams, Galena Park ISD. Co-Moderators are Dr. Roderick Paige, former U.S. secretary of education, and Dr. Jasmine Jenkins, executive director of Houstonians for Greater Public Schools. For questions, email QCS@naacphouston.org or call 713-526-3389. This entry was posted in News, Special events and tagged NAACP Houston, superintendent on November 30, 2017 by HISD Communications. As HISD works to find an effective teacher for every classroom, one of the district’s renewed focuses in on strengthen partnerships with colleges and universities to recruit and better prepare new teachers. To help achieve this, HISD hosted representatives from several universities Wednesday to begin a discussion on how the district and higher education institutions can improve the lines of communication when it comes to teacher training and support. Among those in attendance were the University of Houston, University of Houston-Downtown, Texas A&M, Texas Tech, Texas State, Sam Houston State, Texas Southern, Prairie View A&M, and University of Texas Rio Grande Valley. This entry was posted in Teachers and tagged superintendent, teacher recruitment on February 22, 2017 by HISD Communications. The following is a message for the community from HISD Superintendent Richard Carranza in which he shares his excitement about joining HISD and a few of his goals for the district. At the start of every new school year, I would get “butterflies,” whether I was a parent sending my child off to a new grade, a teacher meeting my next crop of young scholars, or a principal in charge of an entire campus. It’s no different as superintendent, but I promise you these are good butterflies – they signal excitement and anticipation about the great possibilities of what’s ahead. The 2016-17 school year has begun, and my first act as your new superintendent was visiting several HISD campuses across this vast and diverse district on the first day of classes. This entry was posted in News and tagged first day of school, superintendent on September 1, 2016 by HISD Communications. New HISD Superintendent Richard Carranza embarked on a whirlwind tour today of six HISD campuses – which took more than six hours and spanned 60 miles – on the first day of classes in the district. 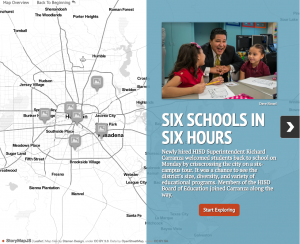 Carranza’s itinerary covered each geographical area of HISD, and he visited with students, school staff, and community members at each location. His first stop was at Law Elementary School on the south side, where he had the opportunity to visit a dual language classroom. Next up was Stevenson Middle School to the southeast, where he observed the launch of the district’s Literacy in the Middle program, which aims to improve middle school reading skills. Carranza then traveled to the Third Ward to Yates High School to learn about the school’s communications and maritime magnet programs. The tour then took him to Carnegie Vanguard High School near downtown, which is one of the district’s nationally acclaimed magnet schools. Next up was Wisdom High School (formerly Lee) to the west, HISD’s most diverse comprehensive high school. Carranza wrapped up the tour at Fonwood Early Childhood Center, where he observed pre-K students on their first day in a brand-new building. This entry was posted in District I - Elizabeth Santos, District II - Rhonda Skillern Jones, District III - Sergio Lira, District IV - Jolanda Jones, District IX - Wanda Adams, District V - Sue Deigaard, District VI - Holly Maria Flynn Vilaseca, District VII - Anne Sung, District VIII - Diana Dávila, Elementary Schools, High Schools, Middle Schools, New schools, News and tagged first day of school, superintendent on August 22, 2016 by HISD Communications. More than 18,000 students are receiving laptops this month as part of HISD’s one-to-one initiative that will eventually give every high school student a computer. The initiative, called PowerUp, not only will offer students 24-hour access to a laptop and a variety of software, but to digital-age instruction that will transform teaching and learning both inside and outside the classroom. This entry was posted in 21st century schools, PowerUp and tagged 21st century learning, Grier, high schools, HISD, Houston ISD, powerup, superintendent on January 21, 2014 by HISD Communications. HISD Superintendent Terry B. Grier has been selected as one of four finalists for the American Association of School Administrators’ (AASA) National Superintendent of the Year. Under Grier’s leadership, HISD was awarded the prestigious Broad Prize for Urban Education, an award that recognizes gains in student achievement and comes with $550,000 in college scholarships for high school seniors. Houston is the only district in the country to receive the award twice, winning the inaugural Broad Prize in 2002 and again in 2013. The district was one of four national finalists in 2012. This entry was posted in Achievement/Recognition and tagged AASA, award, finalist, linked learning, superintendent on January 8, 2014 by HISD Communications. Houston Area Alliance of Black School Educators president-elect Dr. Dawn Randle, left, and president Dr. Christopher Pichon, right, pose with Houston ISD Superintendent Dr. Terry Grier after he was awarded the President's Award from the HAABSE at the Westin Galleria, March 1, 2013. Grier was honored for his efforts in passing the 2012 Bond to improve high schools and other facilities across the district. This entry was posted in News, Special events and tagged award, HAABSE, Houston Area Alliance of Black School Educators, superintendent on March 4, 2013 by HISD Communications. Some of America’s most innovative education leaders gathered at the Houston Independent School District’s headquarters on March 19 for the second meeting of the League of Innovative Schools. Fondren Middle School Principal Charles Foust (far left) explains to members of the League of Innovative Schools how his campus is using technology to drive instruction. Designed to give educators a chance to dramatically increase student achievement through the wise use of technology, the league was launched by President Barack Obama in 2011 in tandem with Digital Promise, a new national education center created by the Congress and the U.S. Department of Education. Superintendents from across the country attended the Houston meeting, where they—along with dozens of respected researchers and entrepreneurs—adopted the league’s membership charter, took part in break-out sessions on various topics, and toured one of five Apollo 20 campuses to see how HISD is using technology to drive instruction. This entry was posted in Achievement/Recognition, Apollo 20, HILZ and tagged congress, digital promise, education, fondren middle school, Grier, HILZ, league of innovative schools, obama, superintendent on March 21, 2012 by HISD Communications.